Once you've learned about the SUMIF and COUNTIF functions, there's one more logical-mathematical function combination that's important to learn: AVERAGEIF. Like its cousins, AVERAGEIF takes the AVERAGE of a range of numbers conditional upon a particular criteria being met. Since the AVERAGEIF syntax is very similar to the syntax for SUMIF and COUNTIF, we won't cover it in as granular detail here. Rather, we'll provide a short example to demonstrate its use. Let's say we want to find the average sales of items in the Baked Goods category. We could do this manually — which is fine for a small table like this one — but that becomes difficult when we have a table that contains a lot more data. That's where AVERAGEIF comes in. It'll allow us to count the number of occurences of a particular phrase within a range. Using the formula is simple: simply specify the range that will be tested against the given criteria; the criteria against which you'd like to test; and the average_range of values to average. 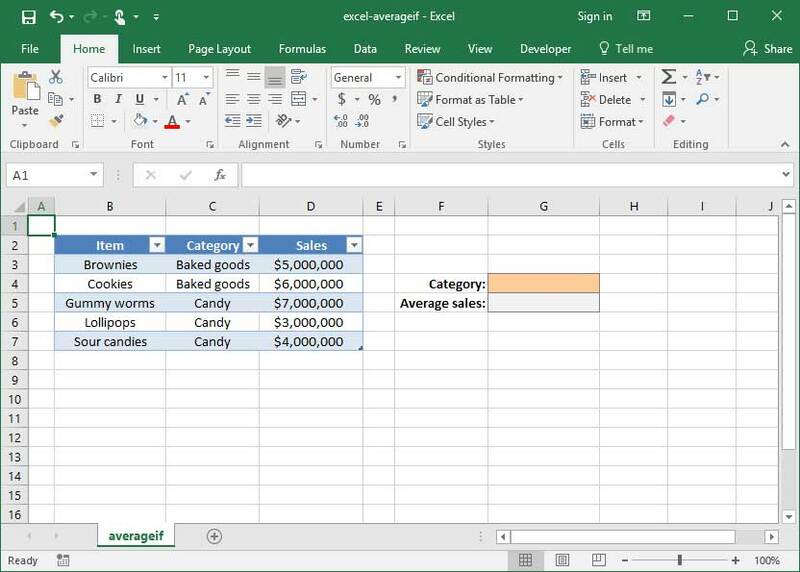 Let's apply the formula to the sample spreadsheet shown above.